A collection of news, knowledge, and miscellaneous Banksy art madness. Banksy, a quasi anonymous graffiti artist from Bristol England, has been making a name for himself on the British and international circuit. Some view his artwork merely as graffiti while others consider his work to be a comment on present-day society, politics, and life in general. 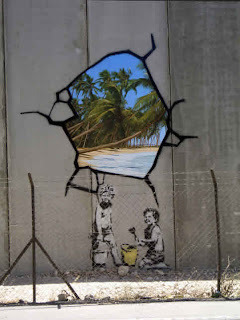 Banksy graffiti in Palestine is the latest addition to his ever expanding global presence, and what a perfect place to make statements about political strife via urban work. Since Israel became a nation, a constant state of unrest or even armed conflict has become the norm between Israel and Palestine. 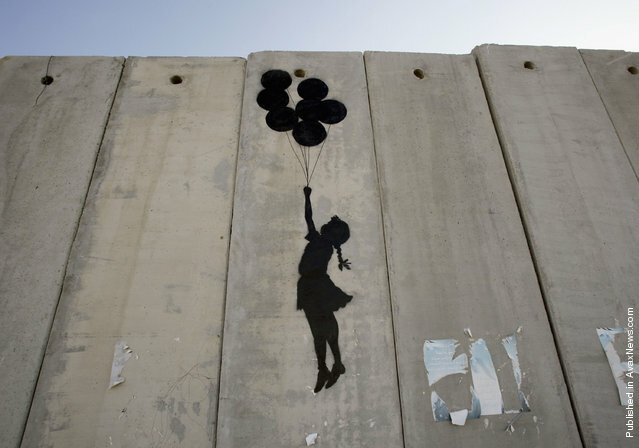 What better place could Banksy choose to offer societal and political statements than on one of the most famous walls in the world, the Palestinian Wall, more commonly called the Israeli West Bank Barrier? This wall serves as a political symbol and functions to separate the two conflicting opponents. Some Israelis claim that the wall gives protection against possible terrorism from Palestine, but even more see the wall as a separation between two cultures and religions. After a disagreement in 2002, Israel began construction of what will one day be a 430-mile long wall. Ninety percent of the wall consists of fence work and trenches, while the other 10 percent is concrete. 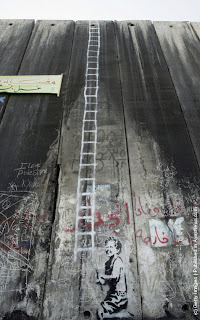 The concrete portion of the wall on the Palestinian side is where Banksy chose to make his artistic statement. In typical graffiti fashion, the work was discovered by passersby after the famous artist has left the scene. Bansky used the wall to paint his sometimes subversive artwork in 2005. The Palestinian art collection, a total of 9 pieces, was cataloged before counter graffiti artists began painting over the work. This made it difficult to account for all nine pieces by name and date of completion. Some of the paintings were never given official names but are merely described by the art content itself. Some want to include additional paintings on nearby Palestinian and Israeli walls and buildings as part of Banksy's Palestinian work. Whether there are simply nine or more, all serve the point of bringing notice to the often less than popular wall and its plight. 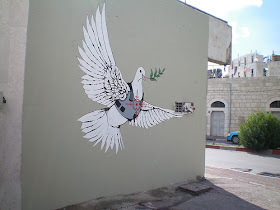 1) Armored Dove of Peace: Although located on a building in Bethlehem, this piece of work is often included as part of the nine. This piece of urban art is accredited to Banksy and perhaps several other street artists. The dove, complete with an armored vest and bull's-eye heart target, makes a tongue-in-cheek comment about peace. What better way to display a political comment about the unstable peace in the area than to depict the bearer of peace"the dove"in a precarious situation? 2) West Bank Guard: An innocent child is used to display the tension in the region. In this painting, a little girl, complete with pigtails, depicts the innocence of children everywhere, caught in the middle of strife and political discord. What makes this piece interesting is the willingness of the guard to submit to a search by the tyke. Perhaps he himself is making a statement about the innocence of children on both sides of the barrier. 3) Window on the West Bank: Banksy's art is mostly black-and-white stencil paintings. However, occasionally, he ventures out of his safe monochrome world to paint in colors, especially to make a bold statement. This piece of urban art depicts two comfy chairs, each beside a colorful window, displaying a beautiful mountain vacation scenery. The statement in this picture is pretty clear. Who would want to vacation in a war-torn region such as the West Bank area? 4) Unwelcome Intervention: This picture gives hope to what could be. Two boys are playing in what appears to be a beach area, complete with sand pail, all in the classic monochrome black and white, while on the other side a paradise awaits in colorful blues and palm trees. One can only hope that something better awaits on the other side. 5) Escapism: This graffiti masterpiece depicts a young lad with chalk in hand. The only means of escape from one side of the wall to the other that he could envision was his chalk-drawn ladder leading to the top. The lad is complete with a smile, perhaps not realizing the political statement that his ladder makes. 6) Balloon Debate: Painted totally in black, as if a silhouette or shadow, Balloon Debate shows a young girl, hoping for the other side but only able to do so by letting balloons take her away. 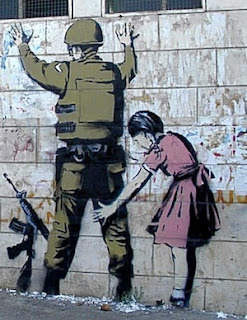 Again, Banksy uses a child to depict innocence against the true hostility of the area and what the wall came from. 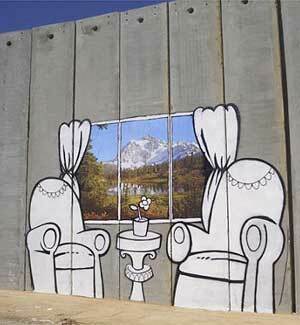 7) Cut It Out: This is the simplest of all of Banksy's wall creations. A dotted line, as would appear on the back of a box, with scissors inserted for directions, begs those walking by to merely cut a piece out of the wall. If solving centuries-old issues was as simple as "cutting it out." 8) Art Attack: Art Attack provides a hint of what could be. A hole in the wall has been created, and on the other side is a boy, complete with his sand pail, merely waiting to play in the sand. This is one of the remaining pieces, and other artists have added both their artwork and comments along with Banksy's work. 9) Stable Conditions: Residents often complain that the wall not only cuts them off from the other side but that everyday activities such as getting to farms and livestock become difficult. Farmers only hope that they find a break in the wall or that a guard shows pity and allows them to pass. This horse seems to be stuck also. All that is visible is his head through one small square and his feet through the other. 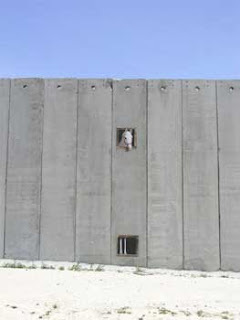 Even Banksy's horse is trapped by the Israeli West Bank Wall. Many on the West Bank became upset and a little less than comfortable when Banksy's urban street art began appearing. 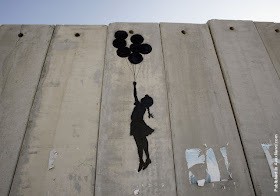 Banksy graffiti in Palestine is seen as an intrusion by many, with one local even saying the work is pretty and the wall was not a pretty thing, so remove the art. Thus some have claimed that the art was merely art and should not be painted over, while others saw the graffiti as politically laced. The latter is probably true, as a majority of Banky's art makes a statement about society or creates a political conversation. Many Palestinian citizens viewed the wall as in incursion on their freedoms and further notification of the friction between Israel and the people in Palestine, and thus felt that the artwork only enhanced this feeling. However, many note that the incident of suicide bombings and violent episodes have decreased since the summer of 2002, when the work began appearing on the wall. No one can know for sure if Banky's art can be accredited with the reduction in violence, but one can only hope. In the meantime, rest assured that Banksy's art will continue to pop up in unexpected areas, making bold political statements that might not be embraced with open arms by all. Bodyguard is a person or group of persons hired to guide and protect another person………hello admin you have written some really good ideas here about bodyguard for security…….I am totally impressed with this post. Many thanks admin. Thanks for sharing the important points of view with us.It is really very nice blog which describes how to decor our home. This is amazing blog.. thanks for this great ideas with us. Many cultures believe that receiving the evil eye will cause misfortune or injury. Mahakala/Mahakal is avatar of Lord Shiva.